Dr. Vernal discusses Caribbean migration to the greater Hartford region with state historian Walt Woodward on “Grating the Nutmeg,” episode 51, June 16, 2018; accompanying exhibition, “A Home Away from Home: Greater Hartford’s West Indian Diaspora” on view at the Hartford Public Library, 500 Main St., 3rd floor, Hartford History Center (Tuesday 1-5pm) until June 29, 2018. Dr. Vernal discusses the intricacies of mounting, writing, and curating an exhibition and teaching a course on child labor and human rights in the cocoa industry. The exhibition, “The Hidden Costs of Chocolate: How Child Labor Became A Human Rights Issue,” is on view at the Thomas J. Dodd Research Center, University of Connecticut, until August 15, 2018. Fiona Vernal is a native of Trelawny, Jamaica and grew up in Trenton, New Jersey. She earned her BA in history with a certificate in African American Studies from Princeton University in 1995 and her MA and PhD from Yale. After completing her doctoral work in December 2003, she served as director of African Studies at Kalamazoo College, Kalamazoo, Michigan. 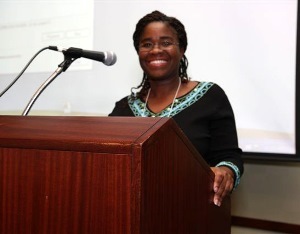 Since 2005 she has taught at the University of Connecticut’s Department of History where her courses focus on precolonial, and colonial Africa, the history of South Africa, slavery, and the African diaspora. Since 2015, her teaching pedagogy has shifted to incorporate inquiry-based learning and human rights practice, yielding the exhibits: “Children of the Soil: Generations of South Africans under Apartheid” (April 2016) and the upcoming “Child Labor and Human Rights in Africa” in 2018. Her book, The Farmerfield Mission (Oxford, 2012) explores the relationship between African Christian converts, European missionaries, and the politics of land access, land alienation and the “civilizing” mission of African social and economic improvement in nineteenth century South Africa. Dr. Vernal consults with the Connecticut Historical Society on oral history projects including an exhibit documenting and recording the impact of 9/11 on Connecticut victims, families, and first responders: September 11, Connecticut Responds and Reflects. A second exhibit documented the history of West Indian migrants to the greater Hartford’s area: Finding a Place, Maintaining Ties: Greater Hartford’s West Indians, with a successor exhibit premiering at the West Indian Social Club of Hartford on June 10, 2017 entitled “A Home away From Home.” She is currently engaged in a preservation and photo documentation project on Caribbean migration to greater Hartford. “‘No Such Thing as a Mulatto Slave’: Legal Pluralism, Racial Descent and the Nuances of Slave Women’s Sexual Vulnerability in the Legal Odyssey of Steyntje van de Kaap, c.1815-1822. Slavery & Abolition 29, no.1. (Jan 2008): 23-47. “A Truly Christian Village:” The Farmerfield Mission as a Novel Turn in Methodist Evangelical Strategies, Eastern Cape, South Africa, 1838-1883, South African Historical Journal 61(2)(2009):407-428. — “Discourse Networks and Moral Transcripts in the Cape Colony, 1750-1850.” African Historical Review 43 (2) (2011): 1-36. — “Discourses of Land Use, Land Access and Land Rights at Farmerfield and Loeriesfontein in Nineteenth-Century South Africa,” in Indigenous Communities and Settler Colonialism: Land Holding, Loss, and Survival in an Interconnected World, Zoe Laidlaw and Alan Lester, eds (Cambridge Imperial and Post-Colonial Studies Series, 2015), 102-137. — “Blackening my white friends to make my black friends look white: William Shaw, John Philip, and the mercurial political landscape of missionary work in the Eastern Cape,” in Magnifying Perspectives Contributions to History, A festschrift for Robert Ross, Iva Peša and Jan-Bart Gewald, eds, (Leiden: African Studies Centre, 2017), 37-52. —Review of Missionary Masculinity, 1870-1930: The Norwegian Missionaries in South-East Africa, by Kristen Fjelde Tjelle, International Journal of African Historical Studies, 48 (1) (2015):144-145. —Review of The Equality of Believers: Protestant Missionaries and the Racial Politics of South Africa, by Richard Elphick, International Journal of African Historical Studies, 46 (2) (2013):344-346. —Review of A Living Man from Africa, by Roger Levine, Journal of World History 23:3 (September 2012). —”From the Archive: Immigration Stories from Greater Hartford’s West Indian Community,” Trinity College, 27 March 2017. — “Telling Stories: The Discourse of Slave Women’s Victimhood in the Cape Colony, South Africa,” Penn State University, Department of History and Program in Religious Studies, 27 April 2007. — “No Such Thing as a Mulatto Slave: Concubinage and Racial Descent in the Manumisson Suit of Steyntje Van de Kaap and Her Children, 1815-1834.” Center for Humanities Research/History Department, University of the Western Cape, South Africa, 7 August 2007. — “Alternative Models of Student Engagement: The Role of Exhibits,” Denison University, 20 September 2016. — “Blackening my White Friends to Make my Black Friends Look White: William Shaw, John Philip and the Mercurial Political Landscape of Missionary work in the Eastern Cape,” Robert Ross Valedictory workshop and festschrift, Leiden University, Netherlands, 17 and 18 September 2014. — “Discourses of Land Use, Land Access and Land Rights at Farmerfield and Loeriesfontein in Nineteenth-Century South Africa,” Workshop, Dispossession: Indigenous survival, land holding and loss in the midst of settler colonialism, University of Sussex, July 2013. — “Discourse Networks and Moral Transcripts in South African Slave Society,” African and African Diaspora Studies Workshop, Wesleyan University, April 23, 2010. — “Who’s Your Daddy? Testing Freedom Through White Paternity: The Slave Woman Steyntje Van De Kaap and her Children, Cape Colony, South Africa, 1815-1822,” African and African Diaspora Studies Workshop, Wesleyan University, April 24, 2009. — “The Nature and Varieties of African Studies Programs in the Liberal Arts Institutions,” Africa Network, Annual Meeting, 21 April 2007. — “No Such Thing as a Mulatto Slave: Concubinage and Racial Descent in the Manumisson Suit of Steyntje Van de Kaap and Her Children, 1815-1834.” African Studies Association, Annual Meeting, 16 November 2006. — “Revisiting the British West Indian Guest Worker Program in Connecticut, 1940s-1960s,” Association for the Study of Connecticut History: Insiders and Outsiders: Ethnicity, Immigration and Status in Connecticut, Manchester Community College, 4 November 2006. — “Memory, Identity and Land Reform in Eastern Cape, South Africa,” African Studies Association, Annual Meeting, 4 November 2004. — “Competing Visions of African Socio-Economic Improvement in the Farmerfield Mission Community, Eastern Cape South Africa,” Kalamazoo College, March 2003.